God Kataragama left his lawful spouse Teyvanai Amman to woo the maiden Valli of Kataragama. Ālatti Pūja, Kataragama Mahā Dēvāle. Buddhism; Hinduism; Islam; Christianity A pilgrimage site sacred to practitioners of many of the religions of South Asia, and one of the few places where Sri Lanka's warring ethnic Tamils and Singhalese have been able to meet in relative harmony. Tamil-speaking Hindus relate the shrine to the war god Skanda, who is also called Murukan. Religious Singhalese Buddhists revere Skanda as second in importance only to the Buddha. Kataragama also attracts Christians and Muslims. Though pilgrims may come at any time during the year, the largest number gather for the shrines principal festival, the Pada Yatra, in July and August. Kataragama's myth of origin links the Tamil and Singhalese cultures, and therefore the pilgrimage has come to be a rite of Singhalese national ethnic identification. 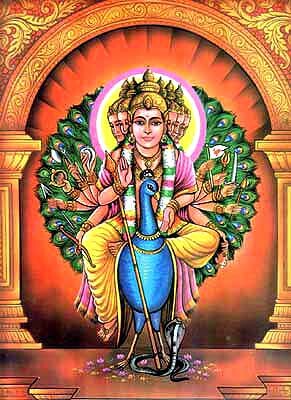 The Tamil Hindu god Skanda, son of Siva, came to southern Sri Lanka to hunt in the forests and there fell in love with Valli, a young woman whose parentage combined the local Vadda and Singhalese stock.  They lived together on Kataragama Hill deep in the dry forests. Skanda's legal wife, Devasena, and the gods who were her allies tried to persuade Skanda to return to her and to the abode of the deities, but he refused, thus expressing his nearness to humanity and the loving combination of the ethnic groups that make up the island of Sri Lanka. 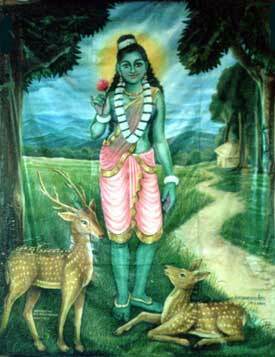 Each night during the annual festival at the shrine the physical symbols of Skanda are carried in procession to Valli's temple, as if to facilitate the sexual union of Skanda and Valli. By the end of the procession many of the Buddhist and Hindu pilgrims in attendance are dancing, weeping or laughing for joy, or have entered an enraptured trance. The festival culminates with the water cutting ceremony, in which groups of pilgrims plunge into the river to dance, splash each other, and release their pent-up religious emotions in exuberant play. In the rather straight-laced traditional Singhalese and Tamil cultures, the appeal of this pilgrimage to young lovers is understandable. 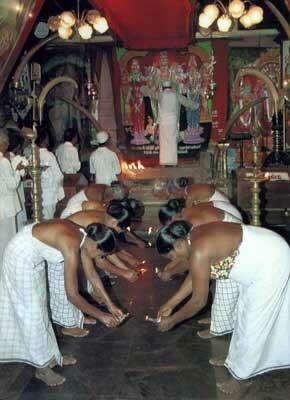 Sri Lankan Hindus believe that the power of Skanda at Kataragama far exceeds that of the shrines of their family, local, or other national gods, some of whom require offerings to enlist their aid, while others require conditions of extreme ritual purity. Skanda at Kataragama transcends all such requirements. His shrine is effective for all, and the Hindu pilgrim expects to intermingle with people of other religions as well as Hindus of other castes, even untouchables. For Hindus, Kataragama is a shrine of ultimate recourse. When an illness is thought to be incurable or a difficulty is insurmountable, Hindus are likely to visit Kataragama as petitioners. Likewise, when some heartfelt petition has been granted, they make pilgrimage to Kataragama to give thanks. Some Hindu pilgrims believe that Skanda favors those who express extreme humility or self-mortification; they may shave their heads and roll on the ground, pierce themselves with thorns or arrows, hang weights from hooks penetrating their flesh, or walk on glowing coals. If they are fortunate, Skanda will grant them pain-numbing trance-ecstasy at the shrine. Sri Lankan Buddhists have been walking to Kataragama for centuries, seeing Skanda as a petition-granting, all-powerful deity who, as god of war, is not always scrupulous with regard to religious purity or a petitioner's motives. His intervention is sought in politics and with the country s judicial system. In addition, during the 1950s—1980s, the Kataragama pilgrimage took on aspects of a celebration of ethnic identity. For many Buddhists, the main pilgrimage festival of Maha Devale turns into a holiday, a fair, and a carnival, replete with dancing, picnicking, and ethnic foods. Many Buddhist pilgrims worship at the white-domed Kiri Vehera stupa under a large bo tree a few hundred meters from the Hindu temple. Daily chanting, vow ceremonies, offerings, and other rites culminate at the full moon with a torch-lit procession of a relic-casket, symbolizing Buddha's presence, carried on the back of a bull elephant. For Muslims, Kataragama is thought to be the abode of the Qur'ans Green Man (al-Khidr), who was the companion of Alexander the Great and who discovered the ma'ul hayat, or the Water of Life. Others believe that Moses himself came to Kataragama to seek wisdom from al-Khidr. There is also a shrine to a Muslim holy man named Palkudi Bawa. At the annual sixteen-day Muslim Esala festival at Kataragama in July, special ma'ulood prayers are recited in the mosque each morning. Muslim pilgrims, too, practice self-denial during their journey, walking barefoot or abjuring smoking or speaking. Some even practice physical self-mortification at Kataragama, cutting themselves or sticking spikes into their flesh. Kataragama's fame waned in the nineteenth century under British control: fewer than one hundred pilgrims were counted in 1877. Located in the southeast part of the country, it was not always easy to reach. There may have been between 3,000 and 4,000 Hindu pilgrims to Kataragama in 1910. When a new road was put through in 1949 and bus service was added in 1952, the number of pilgrims grew considerably, the majority of them Buddhist. In 1973 more than 500,000 pilgrims visited the shrine (E. Nissan 256). The civil war and terrorism in Sri Lanka that began in the early 1980s interrupted the steady flow of pilgrims to Kataragama. For example, the war stopped the ferry service from Rameswaram in southern India to Sri Lanka, choking off the flow of Indian pilgrims to Adam's Peak and Kataragama. Although pilgrim activity came to a virtual halt between 1983 and 1988, concerted efforts have since been made to revive the pilgrimage. In 1988 Swami Muttu Kumar Vel Swami led a large pilgrim group, and since then the pilgrimage has been under the official protection of the Kataragama Devotees Trust, which is promoting the site as a Zone of Peace. In the summer of 2001 some 10,000 pilgrims of diverse religions visited Kataragama. Pilgrims traditionally make their walking pilgrimage to Kataragama from Jaffna, the northern port of entry to the island, a journey of up to two months. Today many travel by car or bus. There are more than seventy subsidiary shrines and religious sites along the way. One of the most important is Okanda, thought to be one of the places where Lanka's ten-headed Lord Ravana paused to worship Siva, and Lord Ravana paused to worship Siva, and where Lord Skanda split a mountain in two with one of his lightning bolts. As in Anuradhapura, the main temple structures are centered in a sacred space (with a nature preserve or sacred grove), constructed by the Kataragama Devotees Trust, complete with pilgrim guest houses, a safe water supply, a school, and an ashram. The Trust intended the complex to be a safe zone in the troubled area. Unfortunately, killings of priests and workers and the resultant flow of refugees out of the area have halted work. Fernando, W. Lionel. Kataragama and Its Festivals, 1819-1939. Colombo, Sri Lanka: n.p., 1985. Gombrich, Richard, and Gananath Obeyesekere. Buddhism Transformed: Religious Change in Sri Lanka. Princeton, NJ: Princeton University Press, 1988. Harrigan, Patrick. "Dionysus and Kataragama: Parallel Mystery Cults" Journal of the Institute of Asian Studies 4, 2 (March 1997):1-28. LaFleur, William. "Points of Departure: Comments on Religious Pilgrimage in Sri Lanka and Japan" Journal of Asian Studies 38, 2 (February 1979): 271-281. Nissan, Elizabeth. "Polity and Pilgrimage Centers in Sri Lanka." Man 23 (1988): 253-274. Pfaffenberger, Bryan. "The Kataragama Pilgrimage: Hindu-Buddhist Interaction and Its Significance in Sri Lanka's Polyethnic Social System" Journal of Asian Studies 3, 2 (1979):253-270.